Oh, that was a lie! I just couldn't come up with anything remotely amusing about Hovind's self-immolation up to now. Please forgive me! I was wrong to tell that fib. I won't do it again. 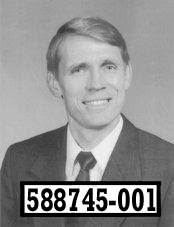 Hovind blames his problems on lawyers, another pastor, the Internal Revenue Service. His own sins are minor. "I forgot to dot some i's and cross some t's," he said. Unfortunately, while he was being held at Escambia County Jail for sentencing, he somehow failed to notice signs on the phones he was using to make eight hours of calls a week that warn that the conversations are recorded. He vowed to "make life miserable" for the IRS, keep suing the government and promote his cockamamie theory that he's tax-exempt. The Judge listened to the tapes and they couldn't have helped his plea for leniency, especially on top of his claim that years of clashing with the IRS was just "i's" and "t's". The one to feel sorry for is his wife, Jo, who is to be sentenced March 1. "I'm sorry, but I don't get it," she says on tape as her husband of 34 years rants about taxes. She just wants to find an accountant who can help them make peace with the IRS and enjoy life with their children and grandchildren. No, it is her husband who doesn't get it. Then again, we've known that since long before the tax thing came up.